Let us do the heavy lifting with our quick start tiny house shell. 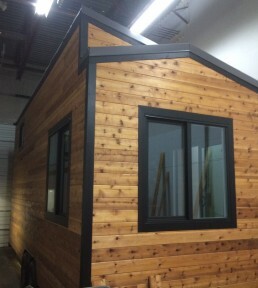 If you would like to build your tiny home but need a quick headstart – We can custom build a tiny home shell for you! Get peace of mind that the bones of your house are built to the highest standards of construction and integrated properly with a custom designed trailer. Our tiny house shells are fully customizable and designed to make your build as simple as possible. After delivery to you, we offer a free help service through the rest of your build to get you through any parts where you could get stuck. Stay in touch! Use our experience and knowledge to save weight, gain height and maximize the trailer to its full potential. We can eliminate design problems you may encounter if you simply haven’t built a tiny home before – No one ever wants to undo anything because they missed a step or something is not quite level! We can help you avoid frustration and tears down the road. Many first time Tiny home builders also do not have the benefits of building in a warehouse. This exposes the tiny home to the elements, weather and other challenges. Get it delivered waterproof, then build the rest as you like at your own speed. Tiny Home Shells can be completed by our team in a couple of weeks and delivered to your site. We want to help you design your unique and extraordinary designs! Get Creative With Your Ideas! Make your selections in the quick start form below. Decide what level of finish you would like for your tiny house shell and what size you are looking for. We send you an estimate based on your selections based on a typical build. If you send us a quick sketch and outline some ideas and themes, we can provide you with a one off 3d Render of your potential design – For Free! Example of Render provided for Free! When you decide you are ready to move ahead to make your Tiny Home Vision a Reality, We then can start the In depth design stage. We then work with you to create a 3d model and render of your complete and finished tiny home. This makes sure you have a clear end goal in mind, and can plan your shell perfectly to achieve the finished product that is perfect for you. We change and tweak designs until we find what is the right fit for your Tiny Home. Trailer arrives to our Workshop and build begins. Depending on size, Level and complexity of build, your shell could be ready in 1-4 weeks after the trailer arrives to us. Structure Shell - Framing, Sheathing complete, Flooring insulated and Sheathed, Hold Downs, Bolts, Straps, Hurricane Ties, Loft Beams Lock Up Shell - Fully Finished Exterior Including Building wrap, Rainscreen, Doors and Windows Installed, Roofing Complete, Exterior cladding Finished, Trims and Fascia Installed and Painted Plug and Play Shell - Electrical Rough In, Plumbing Rough in, Fully Insulated, Wall finish complete and painted.